Check off each item on the departmental noncapital list, as it is located. The list can be either a department spreadsheet or the Noncapital Inventory Form. CORRECT ALL MISSING OR INCORRECT DATA ON THE LIST, I.E. DESCRIPTION, MANUFACTURER, MODEL NUMBER, LOCATION CODE AND SERIAL NUMBER. PLEASE NOTE: THE LOCATION CODE MUST BE VALID ON THE UNIVERSITY LOCATION TABLE. TO FIND THE LOCATION CODE, LOG IN TO CIS, CLICK ON LOCATION CODES LOCATED UNDER RESOURCES & INFORMATION IN THE FINANCIAL & BUSINESS SERVICES PAGELET. IF YOU HAVE QUESTIONS REGARDING VALID LOCATIONS, PLEASE CALL PROPERTY ACCOUNTING AT EXT. 1-3973. The Column headed “COND” (for condition) should be used to indicate current condition of the asset. Please use the following codes. Noncapital equipment that is coded “P” or “O” must be disposed by transferring the asset to University Surplus & Salvage. Under-utilization of assets is a serious audit consideration. Assets that are not being utilized should be disposed. There are times, however, when equipment is intended for emergency purposes and the intent is not to utilize it, i.e., fire protection equipment, security systems or the destruct capability of some sensitive test equipment. If you have any questions regarding utilization, please call Property Accounting at ext. 1-3973. Assets being used off campus must be listed on a completed Off Campus Authorization Form and kept on file at the department. The University location code of the responsible person should be listed on the inventory, rather than the off campus address. Noncapital equipment on your inventory report must have a yellow asset number tag affixed. Yellow asset tags are obtained by filling out a tag request form. If there are assets on your inventory that were purchased from your departmental funds, but are in the possession of another department, a Retirement/Transfer Form should be processed. Remember that as far as inventory is concerned, control of noncapital equipment is the responsibility of the department that has the equipment in their possession. If you cannotlocate assets shown on the inventory report, please follow these procedures, before reporting them as “lost or cannot locate”. Check to see if they are on your off campus equipment list. Look at the last inventory to make sure it was found previously. Inquire of people in the same general area if they have any knowledge of the asset’s location. The asset was cannibalized and not properly documented with an R/T form. The asset was thrown into a dumpster because it was obsolete or considered worthless. The asset was given or sold to someone without being documented properly. The asset was stolen and should be reported to the appropriate police department. If, after considering all of the above without resolution, then the asset should be reported as “lost or cannot be located” on a Retirement/Transfer Form. Send the completed form to Property Accounting for processing. 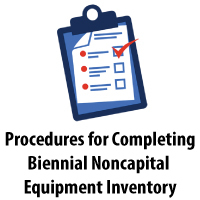 The person responsible for maintaining the departmental noncapital inventory records must be in compliance with all rules and regulations pertaining to noncapital equipment including that all inventory items are in full utilization. This includes government-furnished equipment, as well as equipment transferred to the University from another institution. If you have any questions, please call either extension 1-8673 or 1-3973.